It is the brunt of many jokes in my family – how I often say I am going to do something and then don’t. A perfect example is launching this blog. Just the thought of trying something new or different each week for 52 weeks, writing weekly, and having a deadline has got to be one of the craziest ideas I have ever agreed to. When I told my family, their looks said it all. They truly thought I was going off the deep end. Karen, my driven blog partner, sure has a lot of faith in me. Let’s just say I’m not always a doer. Don’t get me wrong. I get things done and pretty damn well (if I do say so…). I manage my household, work part-time, take care of my husband and girls, am there for my friends and family, remember to buy the cat food (and feed her too!) – but I’ve come to realize that I rarely “get it done” without a lot of thinking about it first and a fair share of procrastinating. I get “stuck” a lot. So when the opportunity to commit to this experiment to try something new, or different, or shake things up a bit was presented, I finally decided (tentatively at first) it was time to get “un-stuck”, have some fun in the process, and maybe even inspire someone else to make a change and move forward. So where did I go? Trapeze lessons, perhaps? Nope, not yet. While that is on my 52 week to-do list, I wasn’t quite ready for that experience. Baby steps, people, baby steps! No, I decided to sign up for a weaving class. Seriously! Here’s the deal. Every day for a year, I have walked past a little storefront a few blocks from home. Initially, I’d just quickly walk on by and give it a side glance. I kid you not – for a year I’ve been walking past it. At first I’d walk by and take a fast peek in the window. On another occasion, I picked up a pamphlet. Then I went to the website. Got another pamphlet. For some reason, this place always intrigued me. Was it the quirky underground space that reminded me of Laverne and Shirley’s basement apartment? Was it the fantasy that I’d walk in to this weaving studio, have a Zen moment and start singing Kumbaya with the others in there? After a few failed attempts, I finally made the appointment, determined not to think about how boring this could be or what if my “artistic side” didn’t carry over into weaving and I wasn’t any good at it. As I walked in, I was asked to take my shoes off (thank goodness I had gotten a pedicure last week), and led through a tiny doorway. The space was a little oasis of colors, creativity, and serenity in the midst of the city – it didn’t seem to belong here. The owner, a quiet woman dressed in one of her beautiful creations, showed me to my loom and explained how to begin. Her calm demeanor and few words forced me to hold in the nervous chitchat that often gets the best of me. I listened and tried not to ask too many silly questions. Very soon, I realized that there weren’t a lot of rules to this. It was actually quite simple to do. Almost too simple – I thought. Just like getting out and trying something new every week. The little girl next to me, there with her nanny, graciously shared her “beginner’s basket” of beautiful yarns and fibers. The Australian grandmother sitting across from me working on an intricate piece wove side-by-side with her 4 year old grandson. It was his 3rd time here, he proudly told me. As I started to weave, moving my feet on the wooden pedals of the loom and pulling the colorful yarn through my fingers, I glanced less at the others around me, and became more confident. Soon the rhythm took over. Hey, this was fun! I thought about telling the woman next to me why I was here but resisted and realized it didn’t matter. I was here. Just enjoy! I was actually getting the hang of it. It was out of my comfort zone yet oddly comfortable. And then it was time to go…I left feeling proud. 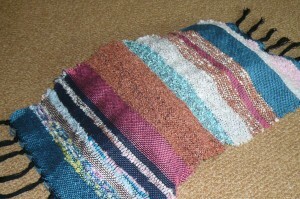 It is funny that a simple little thing such as weaving on a loom for two hours could have lifted my spirits for the day. But I felt good – for agreeing to journey with Karen, for making a cute little tapestry, for using colors in my design that I usually don’t like to try, for just doing “it”. Later that night as I showed off my masterpiece to my kids and my daughter’s piano teacher, it was great to see their interest and know I was able to spread the word and my good vibe I had all day. Pam, we’re on our way! So excited to be doing this with you! Congrats! Your partner in crime! That’s pretty awesome. I know what you mean about our moths getting the best of us. In such a noisy world quiet is good!! I’ve recently begun to explore the arts & have found it to be deeply rewarding. Don”t misunderstand, I’m not very good at it, but i’m doing it. Something new, just for me. Yeah!! Very fun to read your first week’s activity! (I want to start weaving now!) Good luck, and I look forward to your posts for the next 51 weeks!! Way to go Pammy. The first is always the hardest. Smooth sailing from here! Nice job! :) If I tried not reading for a week or something like that I’d explode! You and Karen did an amazing job! It was a lot of fun to read and I am really looking forward to the next one. You are officially “un” stuck. :) Great job! Loved your blog Pam! Both pieces are very good, well written and fun. Pam and Karen! LOVE LOVE LOVE this blog . . . I will post on FB, and help get some traffic over here. It’s a great concept, and people (me, included!) will want to know what new thing you tried each week. Really great. And, the fact that you have a built-in PR genius is . . . sheer genius! Thanks so much, Barbara — for everything!! This is awesome, Pam! What a great idea, and well done. Congratulations! I look forward to your weekly posts!